we call them Special Touches. 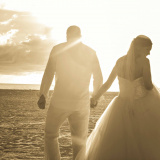 Take a stroll through our interactive gallery to experience our unique and affordable Special Touches to complete your ultimate dream beach or lake wedding. One of the three seating options from which to choose. 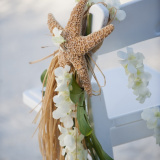 Bamboo chairs are super cute and add a unique presence to complete the beach ceremony theme. $7.50 per chair includes delivery, setup, breakdown and removal. Up to fifty (50) chairs available...additional will be secured through an outside vendor. 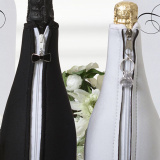 Consider including sashes with the chairs - they add beautifully to the elegance of any wedding celebration! - $2 per chair additional. One of the three seating options from which to choose. White resin chairs add that traditional feel and, as shown here, look amazing with chair sashes in your wedding color! $7.50 per chair includes delivery, setup, breakdown and removal. Up to fifty (50) chairs available...additional will be secured through an outside vendor. A perfect addition to a chair rental, for both bamboo and white chairs. These beautiful sashes will add the perfect amount of color to accent your ceremony package. $2.50 per chair. Walking to the hand of your soon-to-be partner in life with your song playing is an amazing way to begin your ceremony. Music adds the perfect Special Touch. You choose between recorded music and coming down the aisle to your special song, or our live options such as with guitar, saxaphone, violin, or harpist. Nothing says the beach like a Steel Drum Player. Upgrade to our Cake Cutting Ceremony Deluxe to include guests in the cake celebration. Guests receive cupcakes that match cake design. Rustic table and napkins are included - $4 per cupcake, 30 minimum. 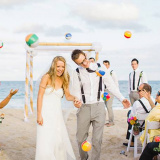 One extra that a bride may want to consider is a Ceremony Rehearsal. 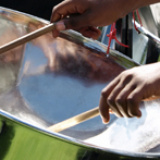 For many of our events, a rehearsal isn't necessary. The couple and their bridal parties are given easy-to-follow instructions just prior to the Ceremony. But for those who have large bridal parties, or special readings or family moments incorporated into the Ceremony, a Ceremony Rehearsal can be helpful to familiarize your attendants with how the process will work. Rehearsals are generally scheduled for the day before the Ceremony at the same location as the event. $250. 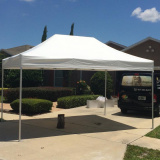 We offer this tent as a backup for inclement weather. For $200, we will have the tent on hand in case we need to cover your ceremony spot to shield from rain. It's a perfect insurance policy to set your mind at ease. 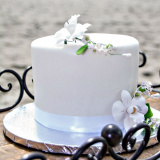 The beach is not the traditional place to tie the knot, so why would you go with a traditional guest book? 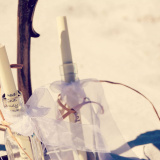 As your guests arrive they will sign their name and a message to the bride and groom. 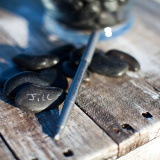 This keepsake of signed stones is the perfect Special Touch for a beach wedding. If you truly want a unique memento of your special day, then choose the Guestbook Stones. Includes table, vase or burlap sack, stones and silver signing pens. $90 for 30 stones. 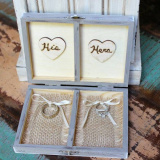 Better Together Weddings offers six (6) options for Ring Bearer Chests. Please click here to view the different chests offered. Please click on each photo in gallery to view description and price. 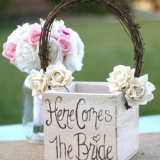 Better Together Weddings offers eight (8) options for Flower Girl Baskets. Please click here to view the different baskets offered. 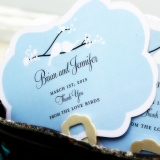 Better Together Weddings offers three (3) options for Personalized Wedding Fans. Please click here to view the different fans offered.